I had a whole "bunch" of really ripe bananas to deal with this week and although I could have frozen them for smoothies later, I was in the mood for some Banana Bread. 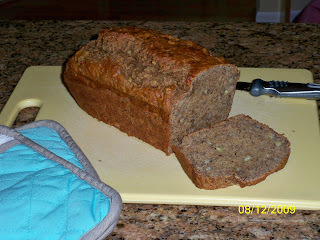 I used the following recipe but also added about 1/4 cup ground flaxseed. 1. Mash the bananas and beat the egg. Now mix them both together with sugar (or honey), salt and cinnamon. 2. Now take a large bowl and mix in flour, baking powder, baking soda and the mess you made in step one (just kidding about the mess :) ). 3. Stir and you are done. Now all there is left to do is pour the batter into the bread pan and bake at 350F (180C) for 50 minutes. You can test the bread by sticking a knife into the loaf and if it comes out clean it is finished. One suggestions, walnuts would have been good as well. Since my kids don't like "chunks" in their bread, I usually grind up the walnuts in a small food processor and then to the recipe. That way you get the flavor and nutrition without the chunks.